Lately I’ve devoted a lot of time to researching possible projects and collecting tips and links to people and places offering classes and tutorials. Pinterest is possibly my favourite site for finding ideas. I love it because it is so visual and quick, and such an easy way of organising ideas which can later be revisited. I’ve also installed a new app called Bloglovin. I’m guessing I’m fairly behind the times in terms of finding something to collate any blogs I am interested enough in to want to subscribe to, but that’s what Bloglovin allows me to do. Needless to say, the blogs on there up to now are pretty much all sewing and craft related. As a holiday treat, I even purchased a couple of magazines. 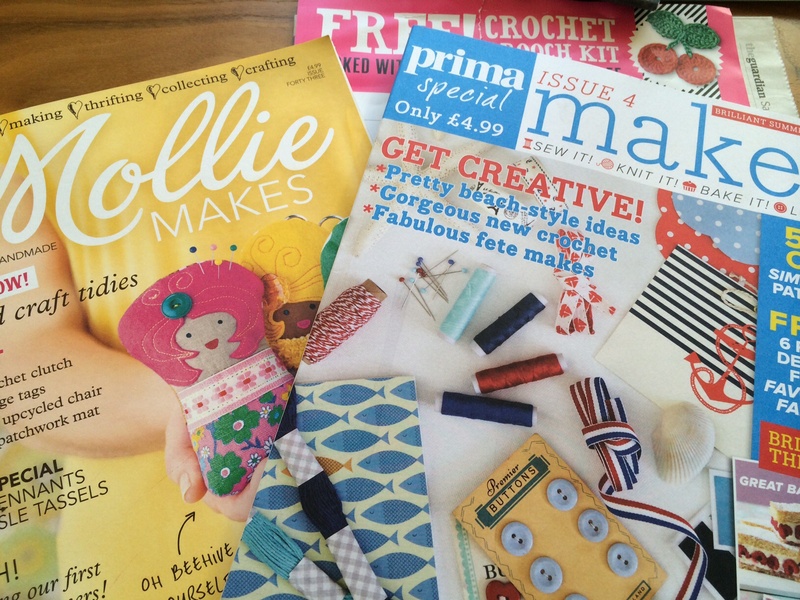 I would like to find a craft magazine I like enough to want to subscribe to, but as yet I’m not ready to commit. These two have appealing matte pages and a range of projects, though I have yet to settle on one. I did get a free gift with each, a kit to make a little purse and materials to make a crocheted cherry brooch.